Testing has proven that SCP 327 provides a cure that is equal to or better than 28 day water ponding, which is regarded in the industry as the most optimal curing technique. SCP is not a membrane that is topically applied and leaves residue that should be removed before flooring is installed. SCP actually penetrates the surface of the slab and, acting as a “curing medium”, provides a superior cure within the matrix of the slab while offering normal construction traffic to resume within one hour of treatment. No protection of the concrete is necessary. This means no delays waiting for the concrete to cure and also enables flooring to be installed within 14 days of new concrete pour. Major large scale projects across the world have adopted SCP as their first choice to protect concrete in construction in numerous industries. 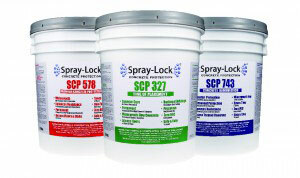 Locally, Vector Concepts has installed over 1.25+ million square feet of Spray-Lock Concrete Protection. Our customers include multiple Independent School Districts across the states of Texas and Oklahoma, major hospitals, minor emergency centers and office buildings. They are assured that their concrete is protected from corrosion and that it is stronger, denser and completely waterproof. They will never have a problem with flooring failure due to moisture in their concrete slabs. Stops Moisture problems in new concrete permanently. SCP technology offers the quickest and most cost-effective protection solutions that meet the demands of today’s fast-track construction process. SCP technology is often used as a superior curing medium. Testing has shown that SCP treatment performs equal to or better than 28-day water ponding. User safe with zero VOC content, SCP allows coatings and coverings to be successfully installed in as little as 14 days after concrete placement with no moisture-related failure problems in structurally sound concrete. SCP technology also minimizes shrinkage cracking and slab curl at time-of-placement, saves costly flooring/surfacing preparation, and leaves no topical residue. SCP technology can be used on any uncoated architectural or structural concrete. After proper preparation and treatment with SCP technology, existing concrete slabs, walls, structural elements, and overhead applications are permanently waterproofed. For distressed structural concrete, SCP offers a formulation to specifically address reinforcing steel corrosion.